This will be easier said than done. To put this into very clear terms, here is a table taken from Reinventing Organizations that shows the evolutionary breakthroughs in human collaboration over time. Every one of these types of organizations is operating around us simultaneously. Some will be designed from launch with a colour in mind, while others will evolve into subsequent colours with hard work and leadership. Importantly, Laloux believes that the consciousness of your Board or C-Suite acts as a ceiling on all aspects of organizational development or transformation. For example, a leader who views the world through an Orange mindset will not be comfortable with Green or Teal philosophies and practices and will work (un)consciously to prevent change. This is important because although organizational frameworks must be comprehensive and synergistic in order to have a chance at success, it’s the people in positions of authority that define allowable behaviour and must give permission for the culture and organization to change. Anyone trying to evolve their organizations must first recognize these limitations. Likewise, a “Teal” senior executive trying to change her organization staffed with “Amber” leaning employees is going to face friction. Constant exercise of power by chief to keep foot soldiers in line. Highly reactive, short-term focus. Thrives in chaotic environments. Highly formal roles within a hierarchical pyramid. Top-down command and control. Future is repetition of the past. Goal is to beat competition; achieve profit and growth. Management by objectives (command and control over what, but freedom over how). Focus on culture and empowerment to boost employee motivation. Stakeholders replace shareholders as primary purpose. Self-Management replaces hierarchical pyramid. Organizations are seen as living entities, oriented toward realizing their potential. Thinking about organizational and leadership development through the lens of human consciousness blew me away. I see many of my clients with orange mindsets struggling to keep up, but not taking the time to invest in leadership or organizational development. They see it as a nice to have, not an enabler for new, more adaptive organizational approaches. General Stanley McChrystal said leaders need to help “develop a shared consciousness of equal information and shared objectives” that then enables autonomy and rapid response. When a respected military general is talking about consciousness in organizations you know things are changing. Meaning: A true match between a person’s passion or purpose and the organization’s purpose. Here’s a simple but deep test: does your key employee feel her life is making a positive difference in the world because of her work at the organization? Is she a stronger leader and contributor to the world because of her role within your company? For some, this will be mostly about mastery of their craft, while for others it may include something broader like societal impact. What would it be like to employ people who do feel this way? Autonomy: When your team all share the same priorities and meaning of your organizational values, and actually own them by using them to make key choices, celebrating others who embody them, and using them as teaching tools, then you can limit rules and process and actually design your ways of working to emphasize autonomy. Where there is autonomy, accountability, and everyone acting as a leader you tend to see nimble, fast-moving teams. Growth: Ongoing development of an individual’s inner world (quadrant one) and skills and experience (quadrant two). Growth also means sharing your wisdom in ways that contribute to an accessible, always-growing collective wisdom that helps your organization creatively solve problems and learn faster than the competition. Impact: Loving the work itself (ideally triggering a flow state), feeling the progress of our team, and feeling resonance about my contributions to others. This is especially critical as a company grows and the “all hands on deck” mentality gets replaced with organizational silos. It’s one reason running structured experiments and having fully transparent key performance indicators can be so satisfying – people see how their contributions impacted the business. Connection: This is about celebrating the whole person to show up at work, and leveraging that wholeness to benefit creativity, motivation, and learning as an enterprise in service of your purpose. Wholeness for an organization means leveraging the full experience and skills of each person by being transparent, asking for help, sharing tools and ideas, and staying focused on a one team approach. Said differently, it’s when the whole is greater than the sum of its parts. It also means enjoying deep and nurturing relationshipswith people inside/outside the organization. Margaret Heffernan’s perspective on social capital is especially instructive here; organizations should emphasize pro-social, nurturing behaviours between its stakeholders by encouraging sharing, teaching, and collaboration across functions, geographies, etc. Interestingly, the internal research Google has done about the most effective teams shows psychological safety felt between team members as the #1 determinant of team success. All talent management programs, especially total rewards, must be in support of these behaviours as they are hugely impactful to flow and adaptability. I know lots of people like Daniel Pink’s three factors of autonomy, mastery, and purpose but I think Tracey’s more expansive definition with impact and connection more fully captures what I’ve learned about motivation and our inherent social nature from neuroscience research. I apologize about using an acronym but what the heck- it’s easier to remember. Keep It Simple: How About A Model? Design Thinking: Three layers in priority order that explain our individual and shared purpose (Why), how we want to be and act (How), and what we’re learning, thinking, and doing (WHAT). A productive, mutually beneficial interplay between an individual’s and an organization’s Why, How, and What layers. 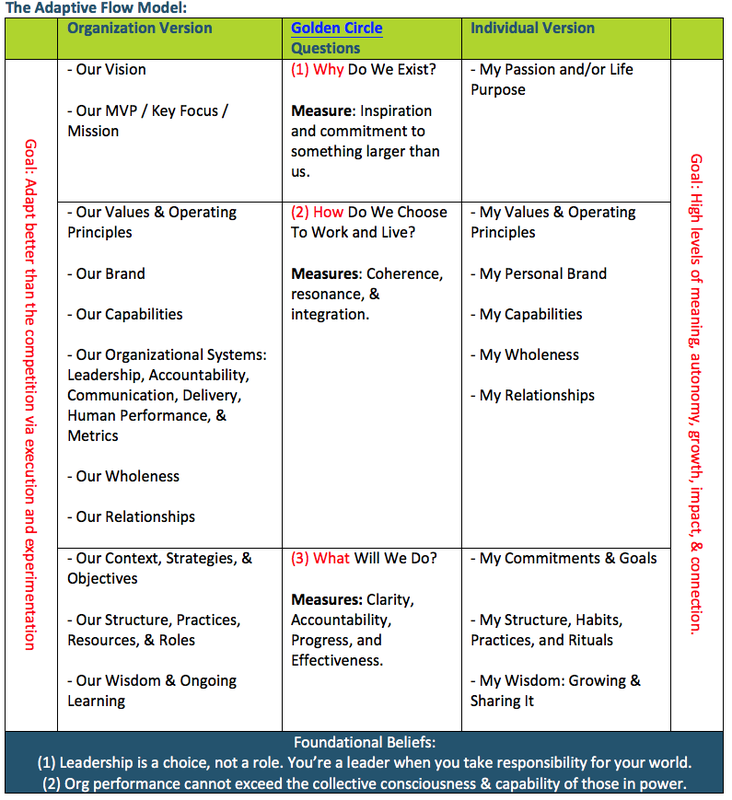 Foundational beliefs about the nature and impact of leadership and consciousness. The opportunity to integrate these elements into a coherent whole first by defining them into actionable, measurable elements individually and secondly by showing how they’re inter-connected. My belief is that culture is the white space between these elements; it’s a result of the things you can control and repeated, rewarded ways of working that in turn shape beliefs. The art of culture at scale is cultivating awareness of these beliefs and choices at a company level into opt-in moments for each person to exhibit leadership and make choices in their world that in turn strengthen the culture. Desired twin goals of this approach: a collective ability to sense, learn, and create (i.e., adapt) better than the competition balanced in a healthy, generative way with high levels of individual meaning, autonomy, growth, impact, and connection.